Sleeper chairs have become quite popular recently. Because they don’t just look good, but can also be used in great variety. Though, if you’re looking for sleeper chairs that can be used by adults, you might have to be a little more picky in your research. Because many sleeper chairs are intended for children, which can make them a nightmare to use as an adult. Unfortunately, there aren’t many sleep chairs in the market that can be used by adults. And the few that support adult use only confine it to short adults up til 5’7″. Sadly, there are no sleeper chairs in the market right now that can be comfortably used by individuals that are 6 feet and above. And the products in this list are not an exception. Which is why we won’t recommend you buying these if you are taller than 5’7″. But for all the shorties out there; here is a list of the top 6 sleeper chairs you can get your hands on. Made of brush microfiber, and constructed of a hardwood frame, the sleeper chair offers a one-of-a-kind user experience. When unfolded, the chair turns into a twin size bed. With the memory foam seat, this sleeper sofa provides a comfortable sleeping experience. Its ample size also makes it adequate for an adult up to 5’7″. Though, the chair can handle two users at a time. Keep in mind, there won’t be any extra space to play with once 2 users are on the bed. This Kristin Round arm sleeper chair by Stone and Beam can give your interior décor an instant uplift. This round arm sleeper chair can be converted to a bed at about a few inches above from the ground. This sleeper chair has maintained an overall positive rating. When unfolded into a bed, the chair measures 55.5″W and 72″D. The chair is very sturdily built using a wooden frame and a polyester/nylon fabric and is backed by a 3 year warranty by the manufacturer. Plus, the chair comes pre-assembled making the purchase less stressful for the buyer. – Does not have a sleeper chair look, thanks to superior design. 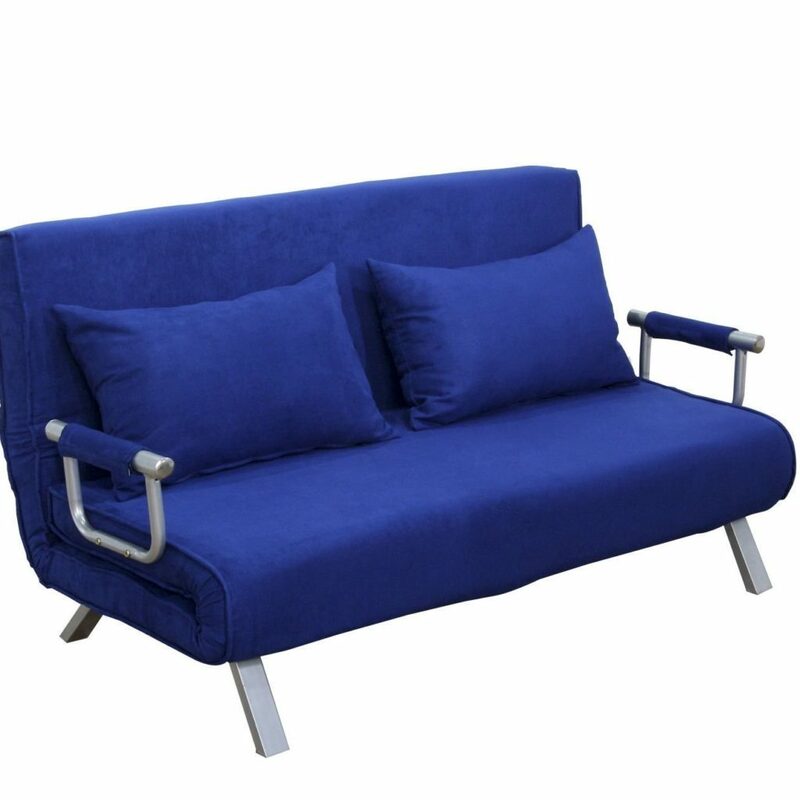 This sleeper sofa from HomCom is another great option for buyers who expect more than one user on the sleeper. This chair gives you the convenience of a removable and washable outer cover. 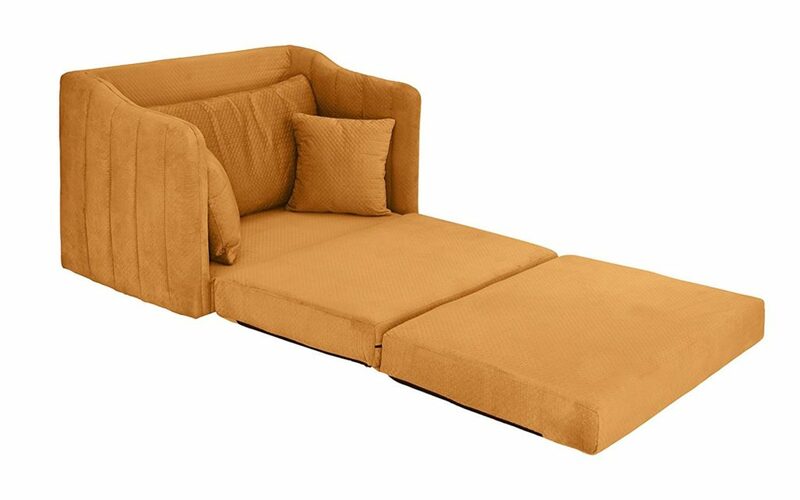 Furthermore, if you are concerned about the space footprint of the sleeper couch you are shopping for, this is a good option as it is very compact in size. 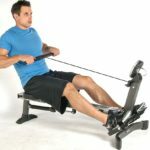 The chair is made of a metal frame, a faux suede outer, a cotton inner, and it can handle weights of up to 300 pounds. – Some assembly will be required. – A little too low, which might make it a little unusual for adults. 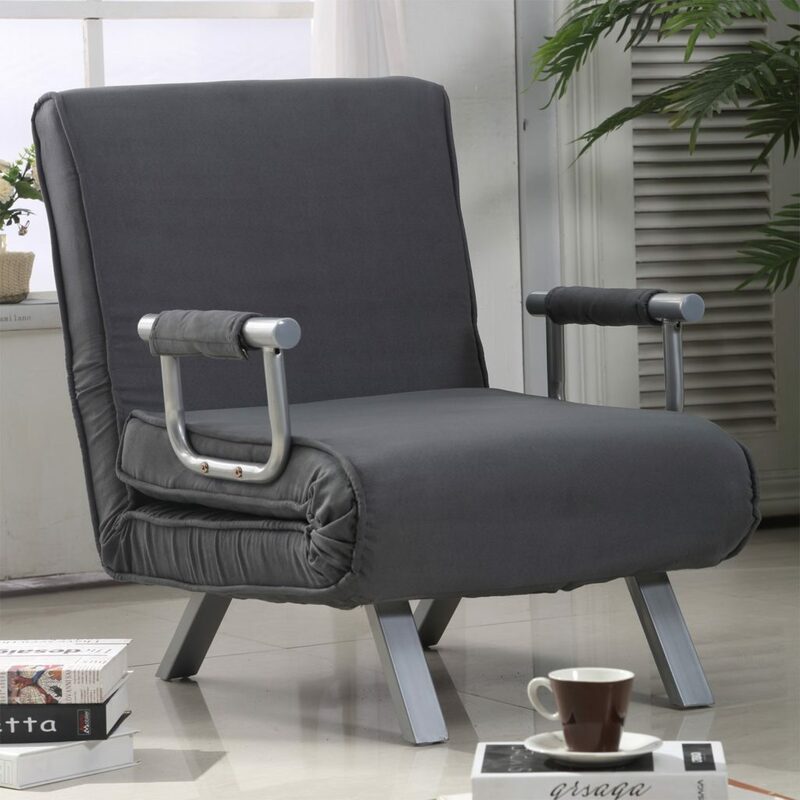 Despite its simplistic design, this sophisticated sleeper chair can give you an amazing sleeping experience. The seat lets users enjoy five sitting positions, and getting it into bed mode is very easy. Also, because of its high quality metal frame, the seat is very sturdy. More importantly, the seat is very comfortable, which is must have feature in any sleeper. Also, like the last HomCom sleeper seat in this review, this product also provides a hassle-free cleaning process since it provides removable outer cushion . – A compact design that ensures better space economy. – Five seat adjustment options for an easier use experience. 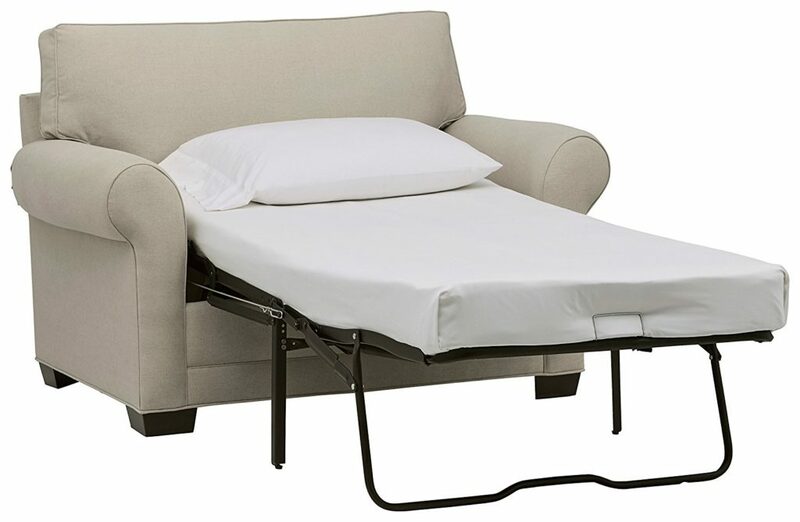 Even though Co-z 5 Position Sleeper Chair is one of the cheapest sleepers in this list, it ensures a premier build by using heavy duty metal frames. 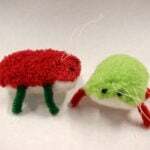 Additionally, it is very comfortable, having been made of dense foam filling, and a cotton blended surface. Furthermore, the backrest can be adjusted in five different positions to provide diverse relaxing positions . The Co-z Sleeper chair is the only product in this list that can swivel 360-degrees. The height of this chair is easily adjustable from 35′-38′. 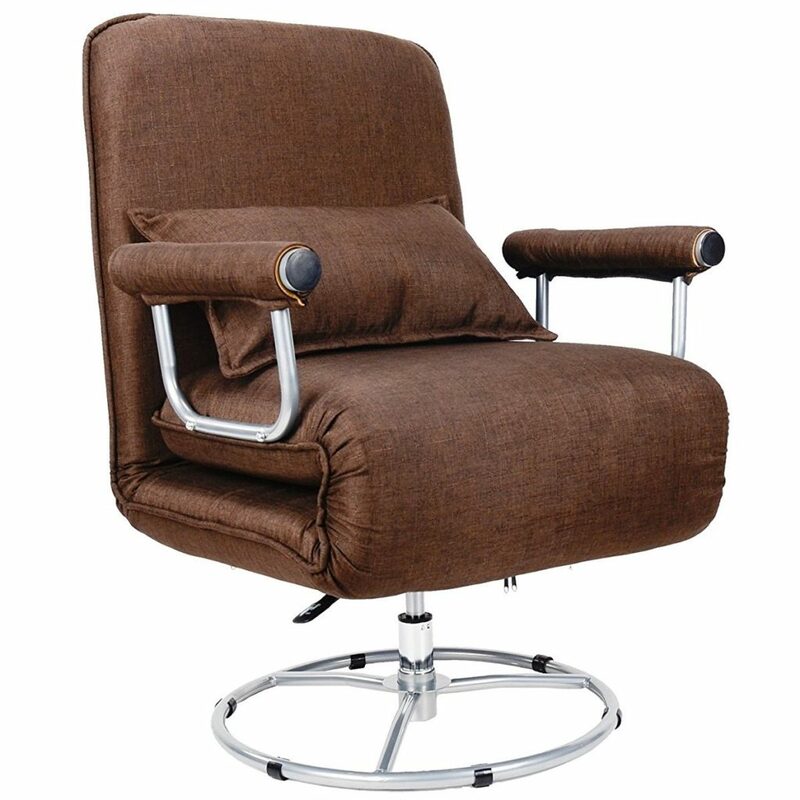 – The sleeper chair features an SGS chair mechanism for smoother and easier adjustment.35′-38′. – High quality construction make the chair very durable and sturdy. – Because of the removable cover, the sleeper chair is easier to clean. Sleeper chairs are an great alternative if you’re short on beds and expecting some visitors to your home. Besides, beds take up too much space, which can be quite unnecessary when the bed is required for occasional use. For this reason, sleeper seats are a great investment for they serve as excellent beds. 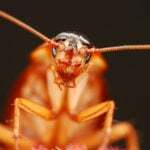 So, the occasional guest, and you as well, can enjoy a restful night sleep. These were the top 5 sleeper chairs available on the market today. Make sure to select a chair that meets your specific space, affordability and comfort requirements.